July 18 2012, Quebec City: a case of Legionaires’ disease is reported to the Public Health Director. In the next week, 4 other cases were reported and an outbreak of Legionnaires’ disease striking Quebec City was declared (Figure 1). Cases continued to appear over the next weeks. The number of cases peaked in late August when 10-20 cases were declared each day. The number of new cases dropped in September and the last case was reported on September 13. The outbreak was officially over on October 8. A total of 183 cases were reported, including 13 deaths. 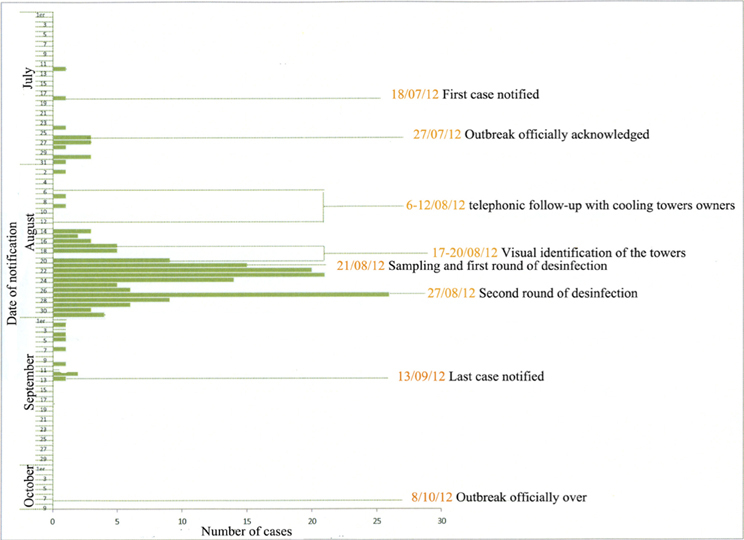 Figure 1: Timeline of the Quebec City outbreak. The green vertical bars represent the number of cases. Key events are also noted. Source: Trudel, L., Veillette, M., Bonifait, L. & Duchaine, C. Management of the 2012 Legionella crisis in Quebec City: need for a better communication between resources and knowledge transfer. Front. Microbio. 5, 182 (2014). Legionnaires’ disease is caused by a bacterium named Legionella pneumophila. This bacterium infects the lungs causing damage to the tissues, and in some people, death. Individuals who are males, older than 65 years old, who smoke or abuse alcohol or who suffer from chronic diseases, such as diabetes and pulmonary disease, are more at risk of contracting the disease. Most of the people infected lived or worked in a sector of the city called “La Basse-Ville”. Right from the start, public health authority suspected that a cooling tower could be the source of the outbreak (see below) and setup a plan to find the cooling tower responsible for the outbreak. This plan included the following steps: 1) inventory of the cooling towers in the area, 2) visual inspection of them, 3) analysis of the load and type of L. pneumophila in them, 4) disinfection of all cooling towers, and 5) prescription of control measures. The source of the Quebec City outbreak was found to be a cooling tower located at the center of the geographic distribution of cases. The source was identified based on the presence of the same type of L. pneumophila as in the patients. The number of cases dropped significantly after disinfection and shutdown of this cooling tower. Legionella pneumophila is transmitted to human through inhalation of contaminated water droplets. In many occurrences of Legionnaires’ disease outbreak, cooling towers are the source of the outbreak, because they offer an environment in which L. pneumophila can grow, and because they creates aerosols, that human can inhale. A cooling tower is designed to efficiently cool hot water coming from a building. This hot water is usually produced in air conditioning equipment, or during manufacturing processes. The cooling tower mixes hot water with air to cool the water, which is then collected in a basin at the bottom of the tower (Figure 2). 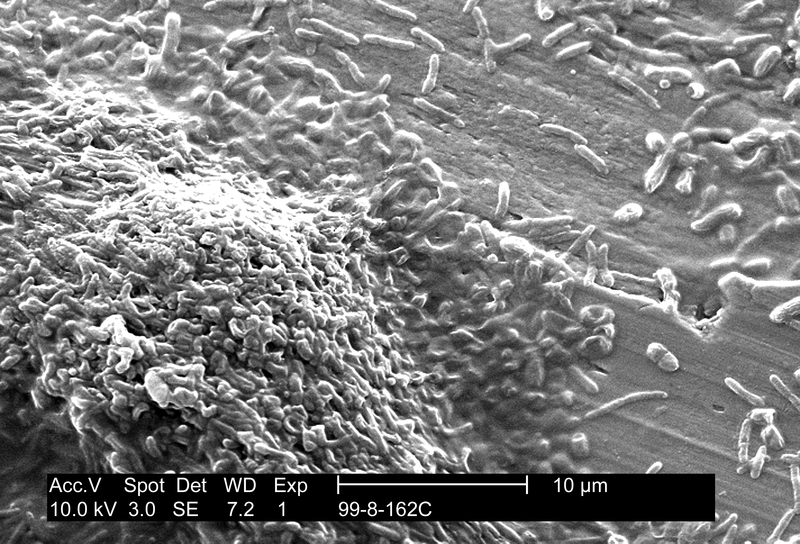 In some cooling towers, biofilms may develop on their surfaces. A biofilm is a fixed mass of microorganisms, such as bacteria, embedded in a gel-like substance (Figure 3). The biofilms attract unicellular animals, such as amoeba, that feed on other microorganisms. L. pneumophila can infect and grow inside those amoebas, using them as a bag of food. At this point the cooling tower is all set to produce L. pneumophila: biofilms feed amoebas which then feed L. pneumophila. 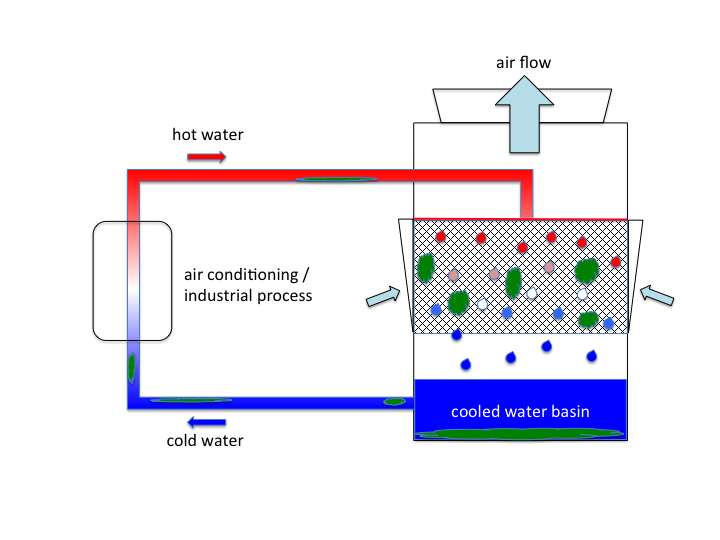 Figure 2: Typical design of a cooling tower. Hot water (red) is sprayed over a mesh and mixed with air to cool it down. Cold water (blue) is collected in the bottom basin. Biofilms (green) may develop in the system. Source: Sebastien Faucher (2015). Figure 3: Electron transmission micrograph of an artificial biofilm composed of P. aeruginosa, K. pneumoniae and a Flavobacterium sp. Note the rod-shaped bacterial cells embedded in gel-like substance. Source: Public Health Image Library, Center for Disease Control, Dr. Janice Carr (1999). The exact cause of the outbreak is still uncertain, but many factors seem to have contributed to this outbreak. Certainly, a set of conditions existed that allowed the growth of L. pneumophila in the Quebec City cooling tower. The overall design of the cooling tower and the water treatment being used, may have contributed to the growth of L. pneumophila. Normally, poor maintenance of the cooling tower can cause an increase in biofilm, and overall contamination. In this case, the cooling tower was under a maintenance plan, and tested regularly for the presence of L. pneumophila, but lime deposit could have concealed biofilms from detection. At this time, Quebec City experienced a hot and dry summer, which would facilitate the establishment of biofilms in cooling towers and require more powerful water treatment and more frequent test. This is similar to the maintenance of a private pool during warmer periods. Surprisingly, there were other cooling towers in Quebec City contaminated with L. pneumophila, but none of them harbored the type found in patients. This suggests that the type of L. pneumophila that caused the outbreak was better equipped to cause infection in humans than the types found in the other cooling towers. The public health director recommended measures to mitigate the risk of future outbreaks, including a national inventory of cooling towers, guidelines for the maintenance of cooling towers and for the treatment of contaminated cooling towers, and protocols for investigating the source of an outbreak. Since then, the Government of Quebec passed a law concerning the owners of cooling towers to ensure that the cooling towers are properly maintained and to alert the public health authorities of problematic situations. Desbiens, F. Éclosion de légionellose dans la ville de Québec, Québec, Canada, été 2012. (Agence de la santé et des services sociaux de la Capitale-Nationale, 2012). Lévesque, S. et al. Genomic Characterization of a Large Outbreak of Legionella pneumophila Serogroup 1 Strains in Quebec City, 2012. PLoS ONE 9, e103852 (2014). Marrie, T. J., Garay, J. R. & Weir, E. Legionellosis: Why should I test and report? Canadian Medical Association Journal 182, 1538–1542 (2010). Murga, R. et al. Role of biofilms in the survival of Legionella pneumophila in a model potable-water system. Microbiology (Reading, Engl) 147, 3121–3126 (2001). Trudel, L., Veillette, M., Bonifait, L. & Duchaine, C. Management of the 2012 Legionella crisis in Quebec City: need for a better communication between resources and knowledge transfer. Front. Microbio. 5, 182 (2014). This entry was posted in Uncategorized on September 29, 2015 by spfaucher.